Another Epic encounter. I bring out the Necrons this time, using the Sautekh list which I haven't used before. 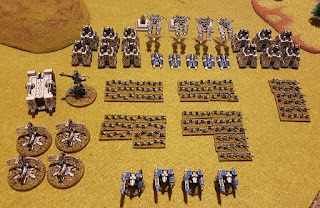 For my list I am using my Deathbot models and some Dark Realm Andrayada figures, with Microworld Grav tanks proxying for the Doom Arks. 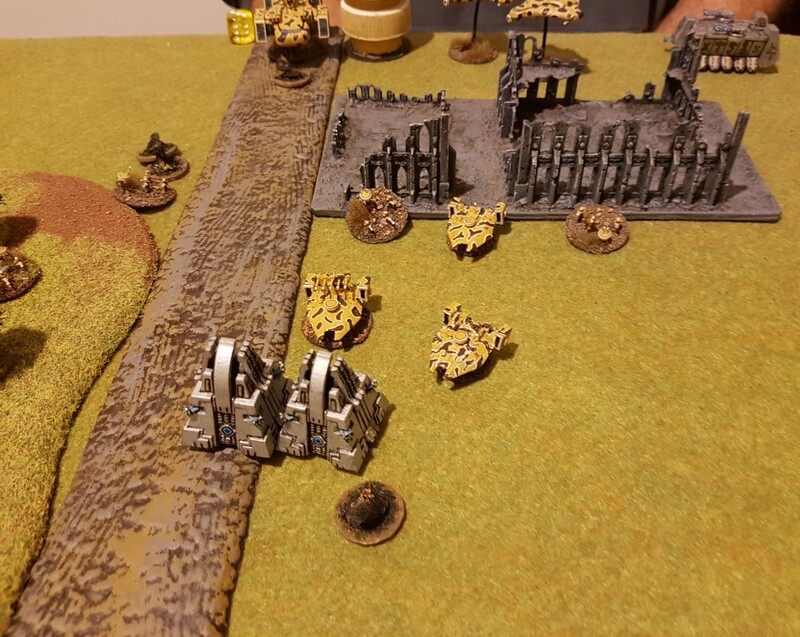 Tau brought a mechanised Tau list, heavy in Tank firepower. Set up! 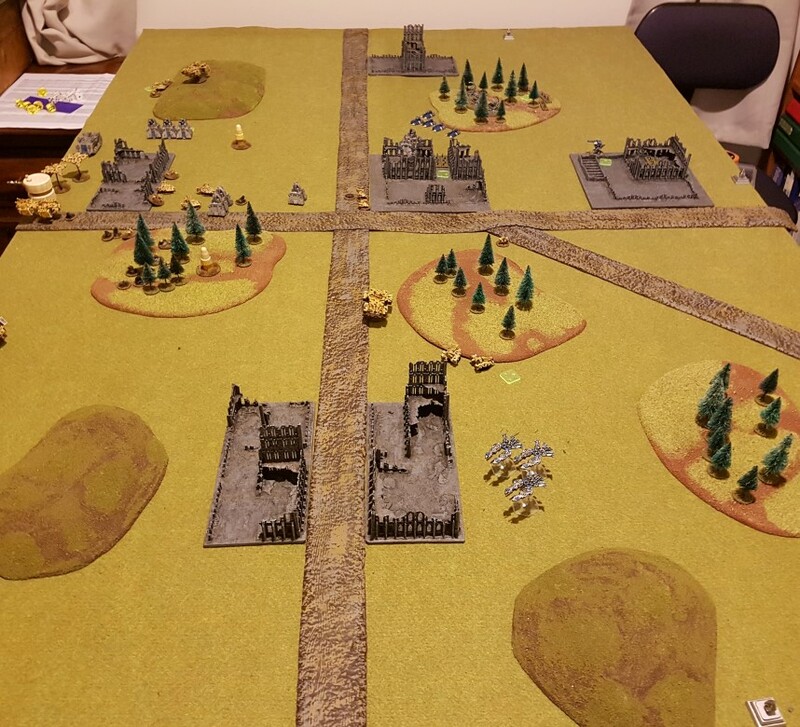 Only my Overlord and Doomsday Ark formation are on the table. The Tau have a Scout screen forwards and heavier tanks behind in mutually supporting positions. 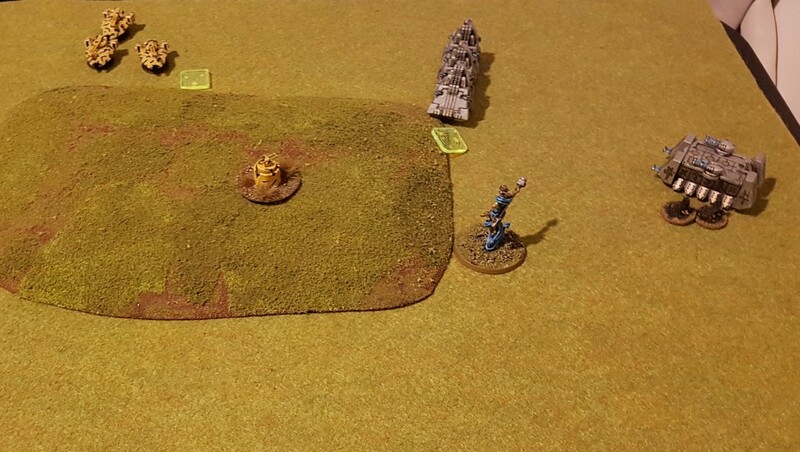 No gaps for teleporters to sneak in. Tau take and hold objectives are on the extreme flanks, and Necron take and holds I place near the Tau Blitz objective in a triangle with it. I teleport on the right flank with most of the teleporters. 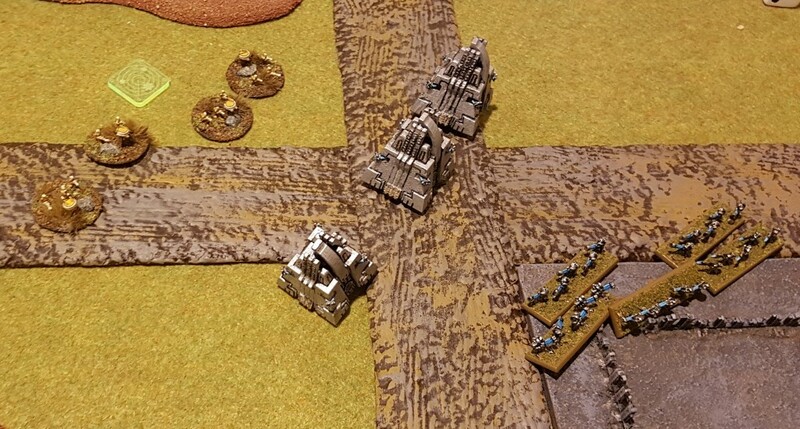 The Sentry Pylons take two blastmarkers, and the Warbarque one. Terrible start for me, but the Tau do even worse, failing their activation with the Hammerheads despite reroll and only placing a single blast marker on the Warbarque. 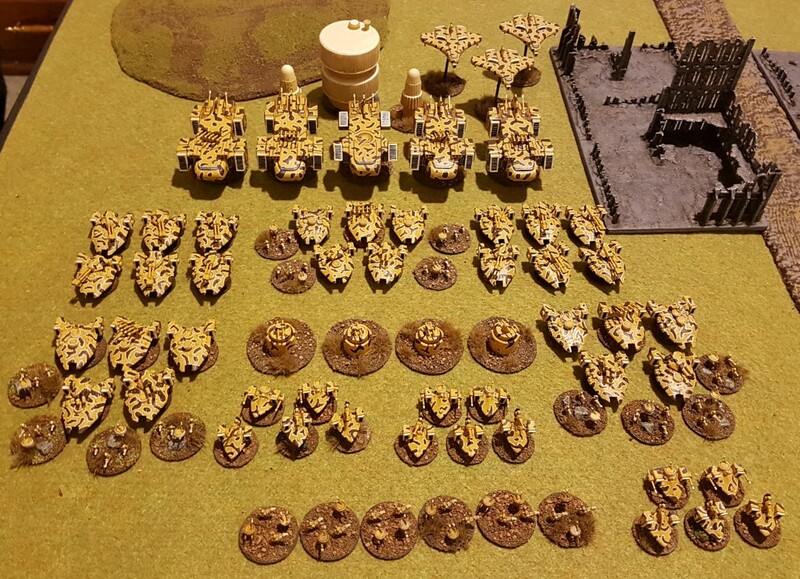 My Teserect Vault (using C'tan to represent it), nukes three of the Hammerheads, and the remaining three retreat. 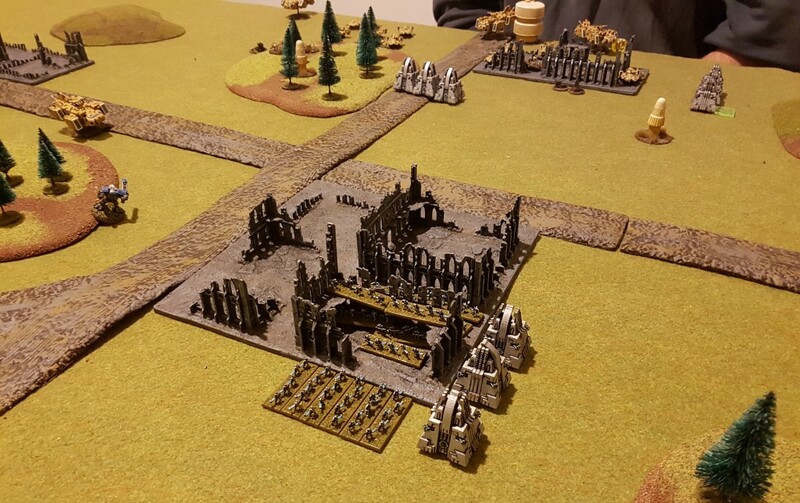 A battle develops in the centre as Monoliths and Necrons knock back the Scout Screen. 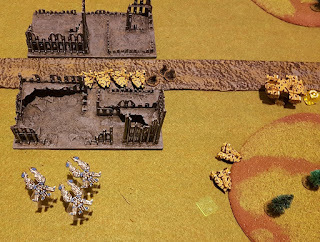 Incoming missiles from Scorpionfish take out many of my infantry. 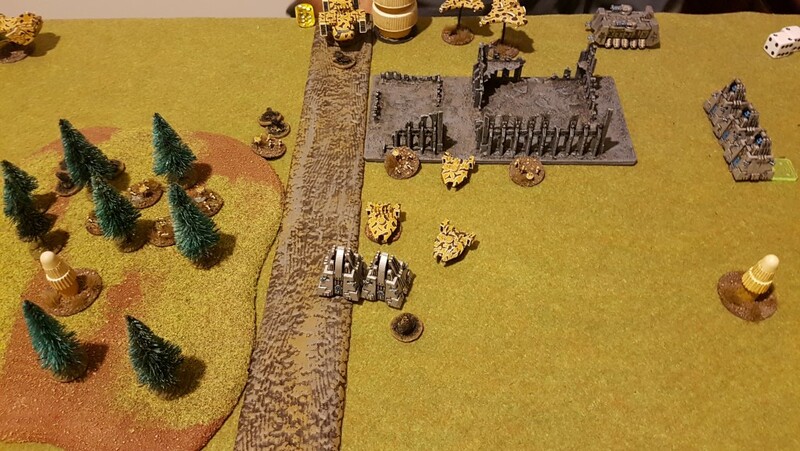 Stealth Suits attack my left flank but are driven back. 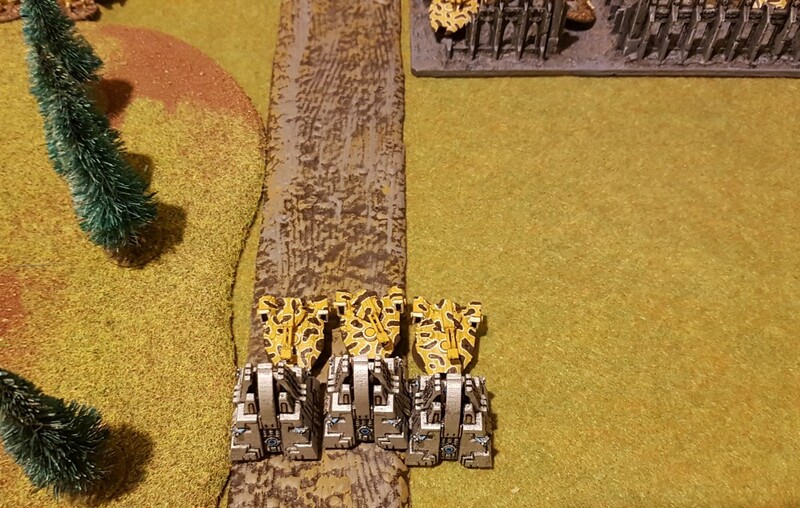 Having dodged my Doomsday Arks all turn, a Tau mechanised formation advances and loses half it's vehicles to them for an unknown reason. 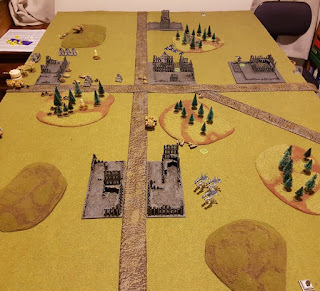 All our planes are on CAP, Tau ready to intercept, and me because I figure I'll lose my Doom Scythes if they try to come on this turn with all the Tau AA still intact and my Sentry Pylons being broken. 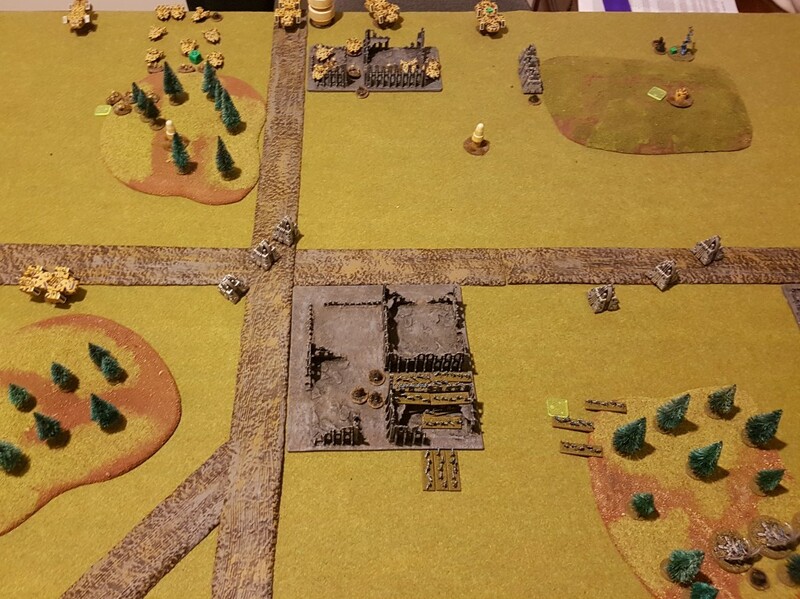 End of turn, and I'm making some inroads on the right, and I've taken less damage than the Tau. A look from the Tau position. All the Necrons rally, some of the Tau are still broken. Necrons win Strategy Roll again. 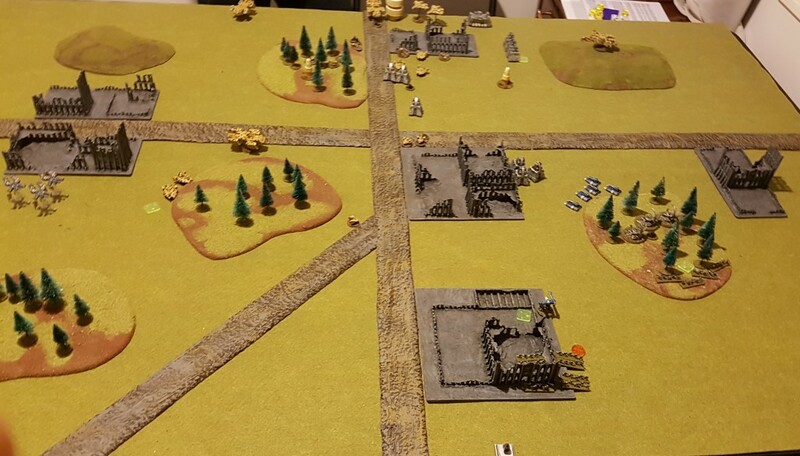 My Monoliths advance and firefight, breaking the Tau (now not mechanised) formation in the centre. 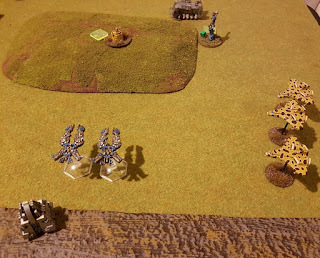 My C'tan damages the closest Scorpion Fish. 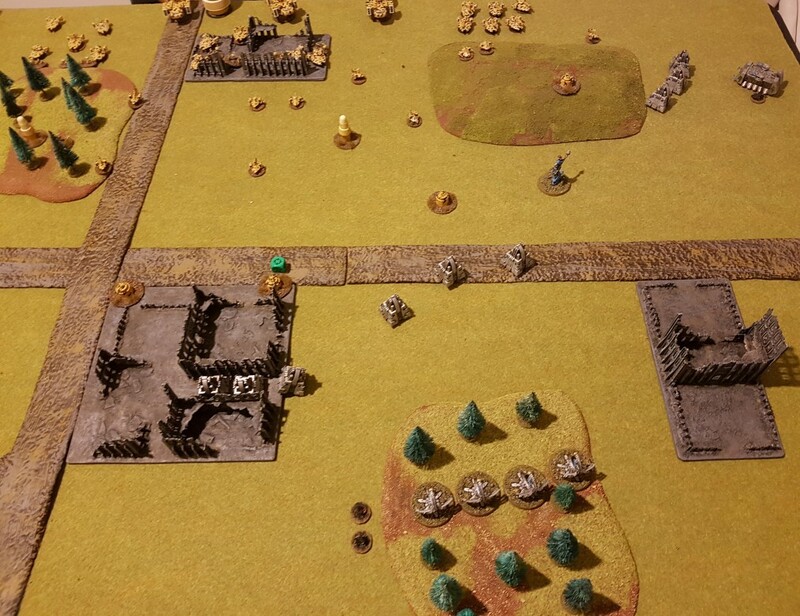 My last Monolith formation has teleported in on the left side of the battlefield. 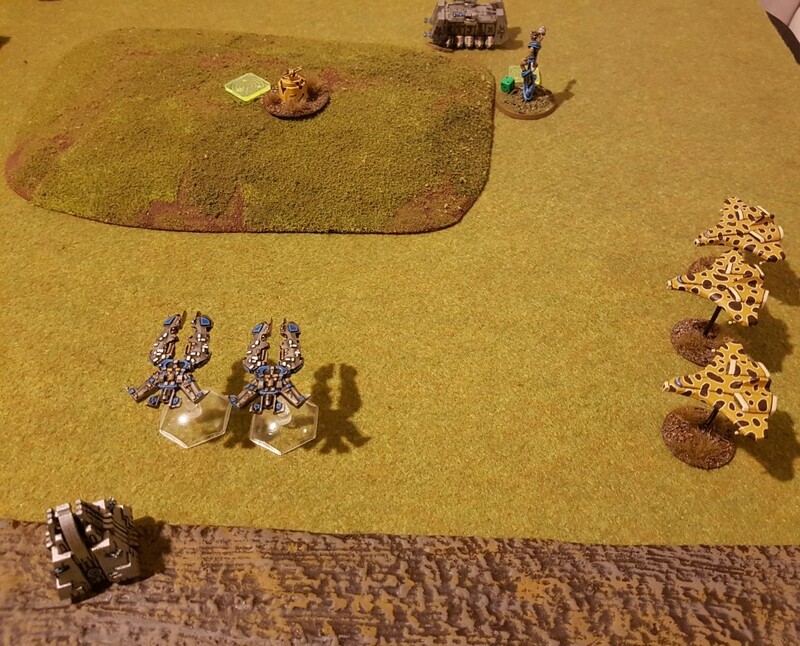 But it is wiped out by a single shot from Tau Recon and then a volley from Hammerheads. My infantry is heavily targeted by incoming fire, but uses its reanimation ability to bring Necrons back and soak up fire. 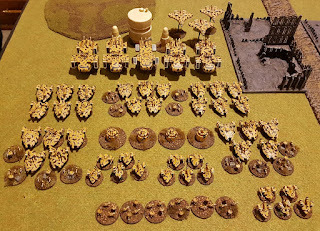 I realise I can wear down the Tau in a war of attrition like this. My Doom Scythes ground attack now I have my Sentry Pylons recovered. 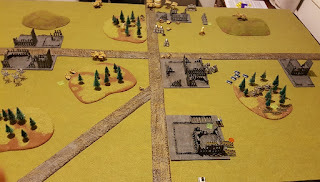 I take out one Tau interceptor with the Pylons, and then the remaining two interceptors destroy one of the Doom Scythes. 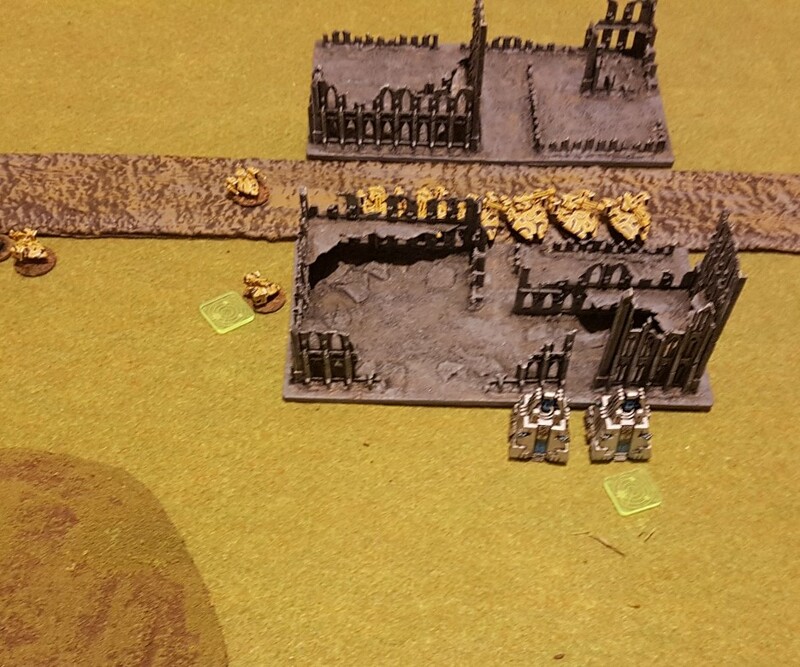 The Doom Scythe wipes out the last Tau Sentry Turret. 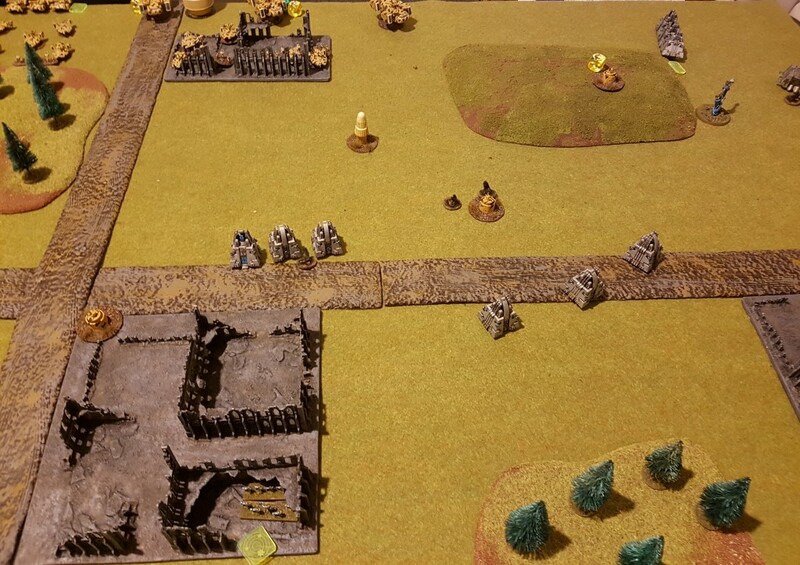 Doom Scythes target the other flank but miss pathetically. End of turn, and my forces are pushing into the Tau position,still having suffered few casualties compared to the Tau. 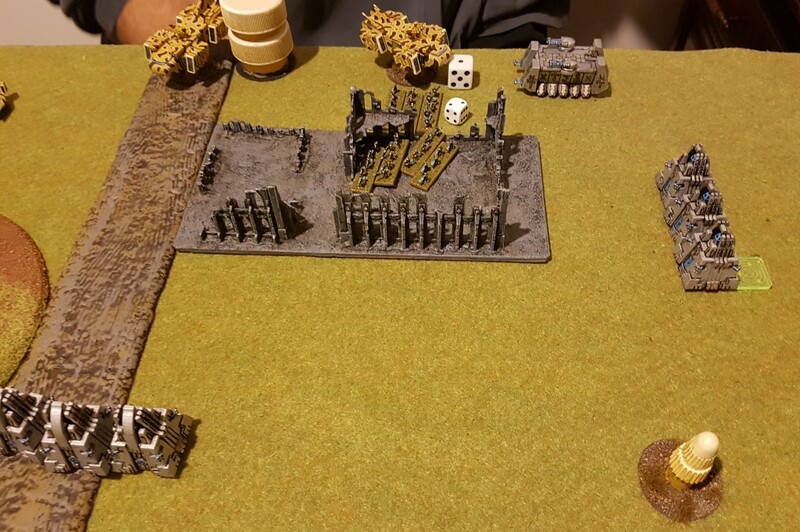 My Monoliths engage and break remains of a Tau Tank formation. 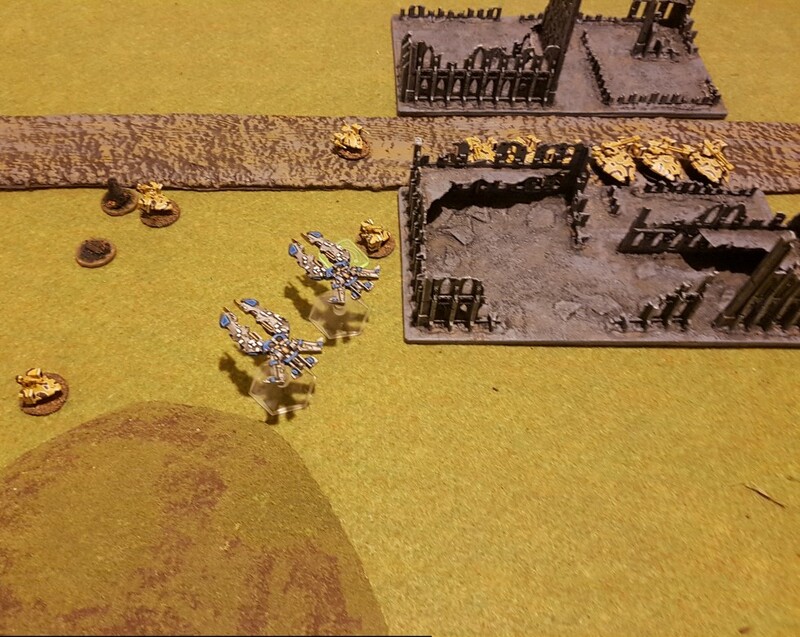 And I have recovered Necron infantry formations ready to portal into the Tau objective area. My Warbarque clears out the Tau Mechanised infantry neary their Blitz with a crossfire, and then my large Necron infantry formation (and Break Their Spirit formation...) portals across the board and out of the Warbarque and destroys a Scorpionfish in an engage action. 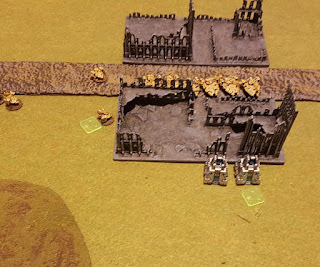 But then disastrously... these Necrons are gunned down, and a lone survivor retreats back through a nearby portal and across the board. 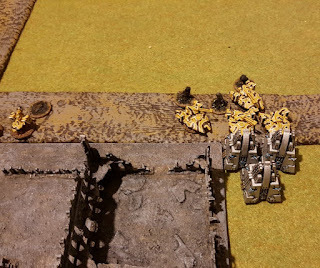 An attack too soon for the Necrons. 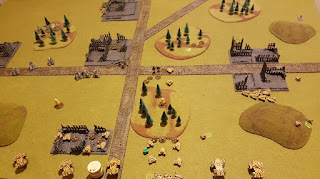 On the left, my Doomscythes wipe out the remainder of a Recon formation and kill two tanks from a Hammerhead formation. 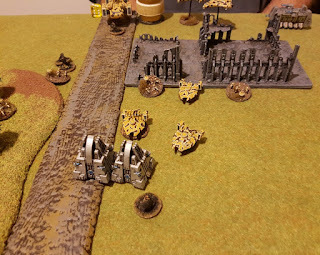 The Tanks double across the battlefield and gun down the lone survivor from my large Necron foramtion (giving Tau Break Their Spirit victory condition). 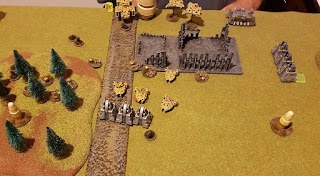 The Tau consolidate and hold their three clustered objectives. 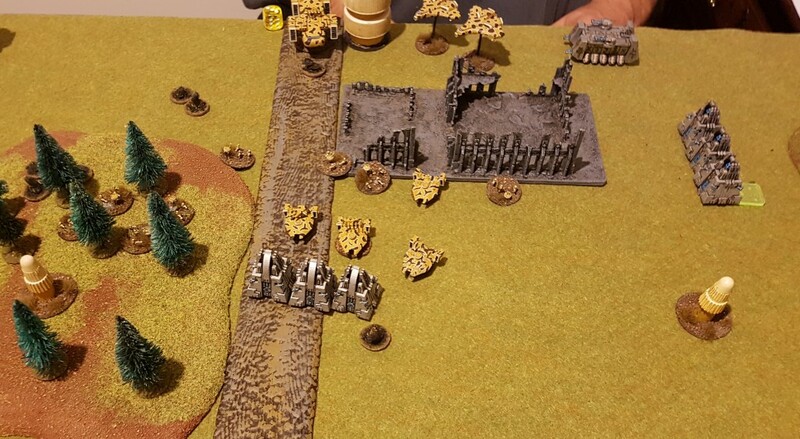 Game to Tau as they achieve Break their Spirit and Defend the Flag Victory Conditions! 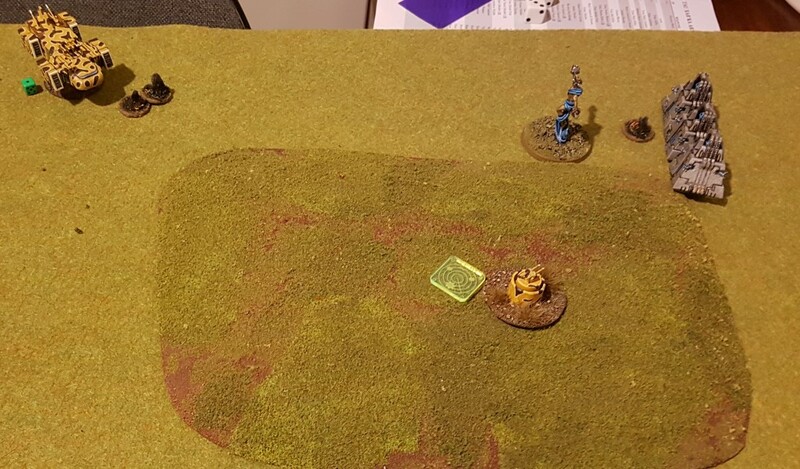 An interesting game with my first use of the Sautekh list. 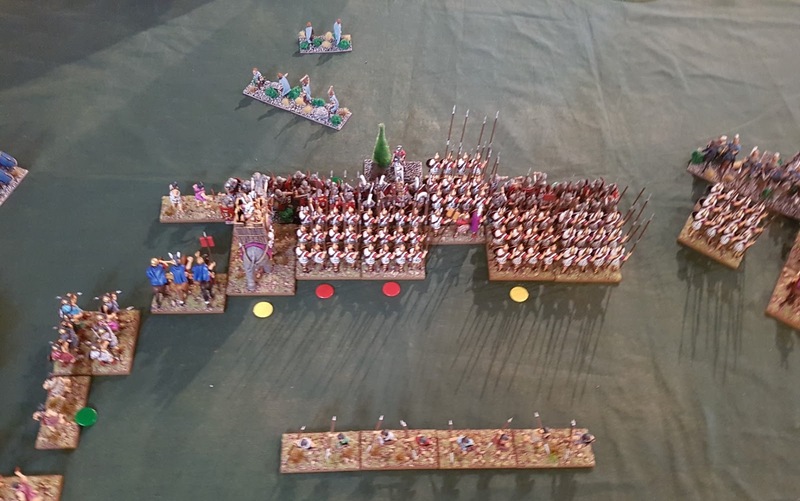 I over-estimated the more weakly armoured infantry and over-committed myself to an attack when I didn't need to in turn 3, losing the game in the process. If I had just been more patient, and kept sucking the life out of the Tau force, while reanimating my infantry, I probably would have won I think. 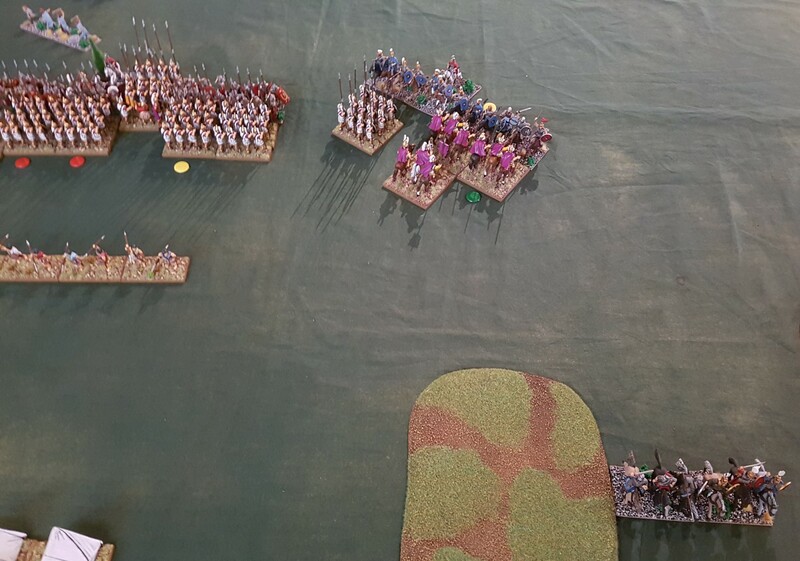 A lesson for next time! 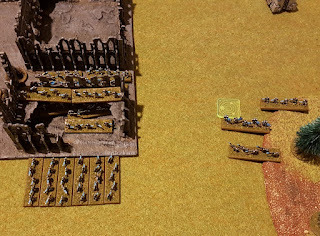 I probably also had too many Monoliths for a force of this size, and not enough infantry to make use of them. 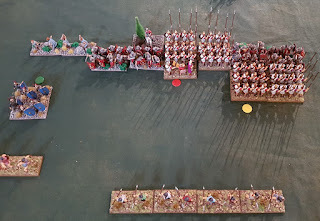 But the Sautekh list has some fun options so I will use it again soon! 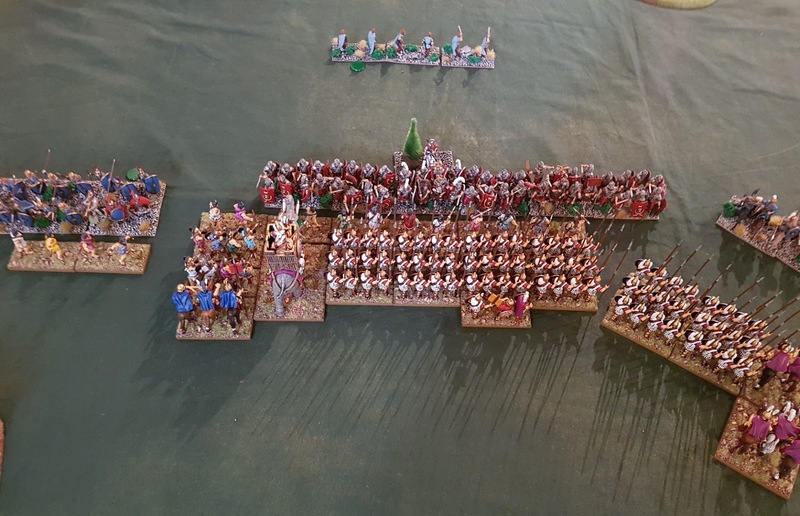 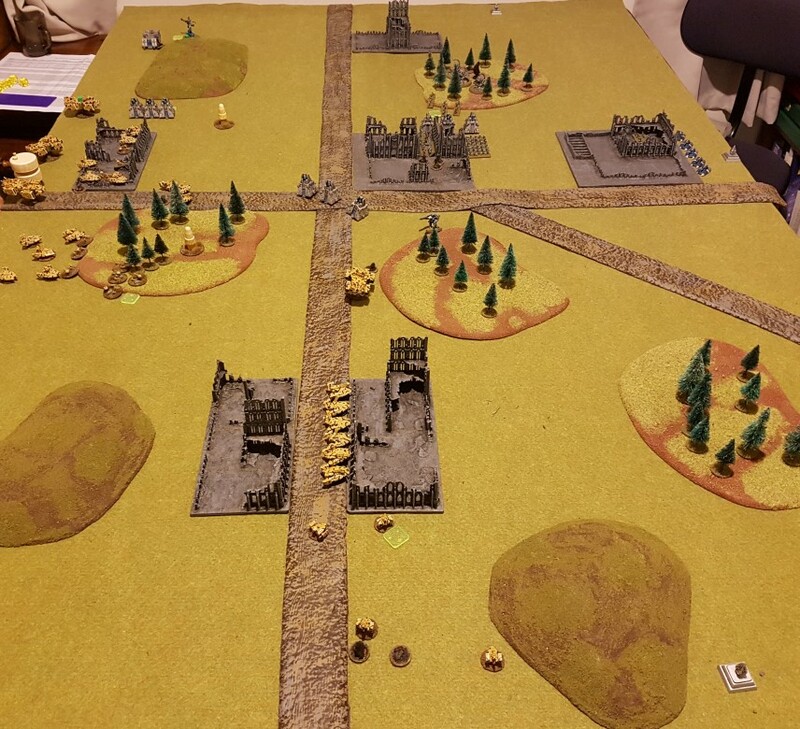 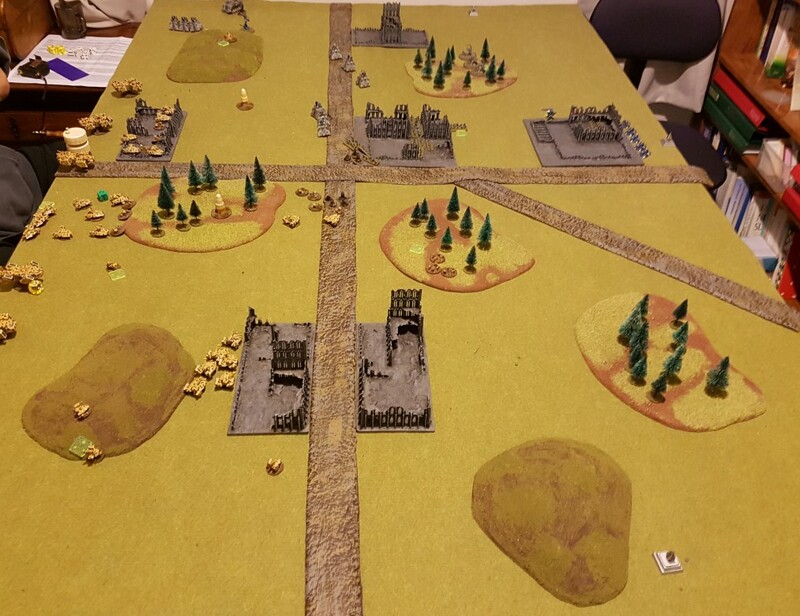 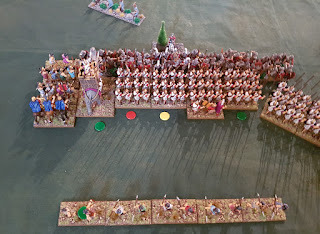 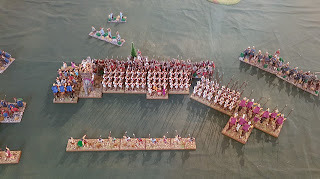 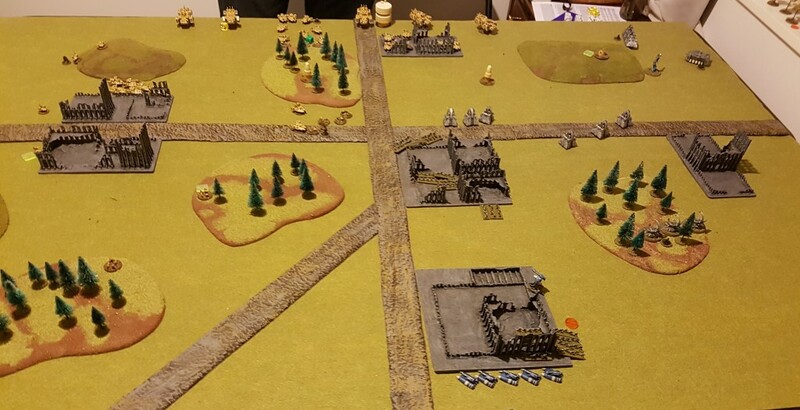 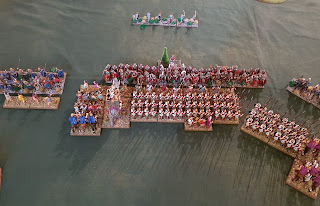 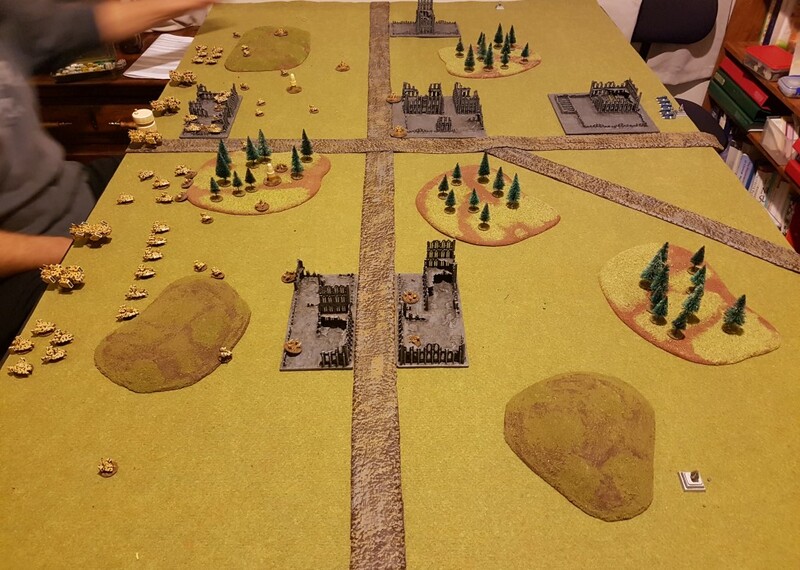 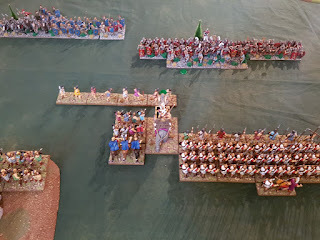 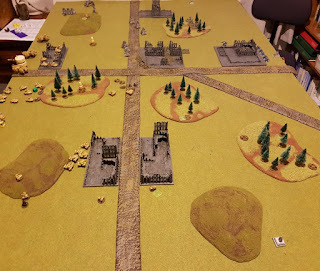 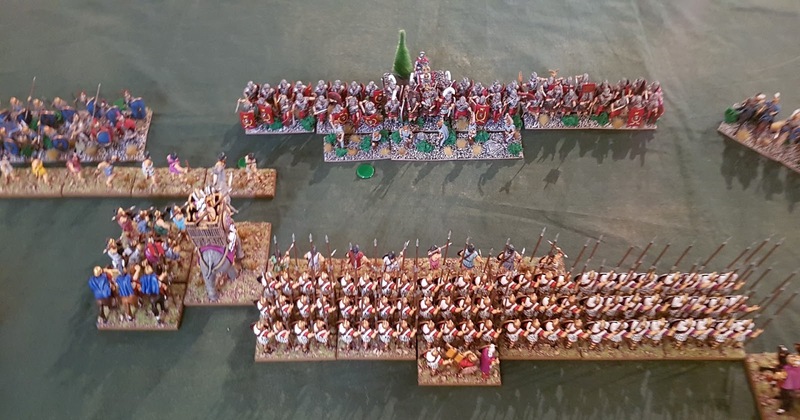 Another game vs Matt who has done a great job finishing painting his new Imperial Roman army over the last few weeks. 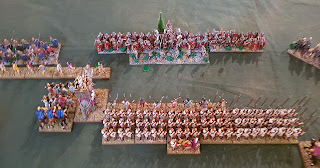 I used Early Macedonian Successors. 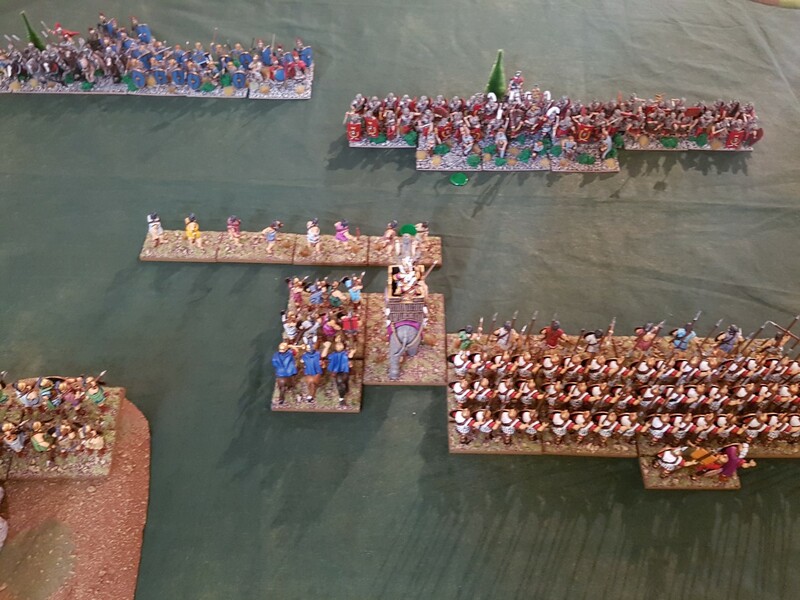 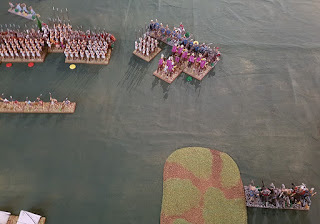 From left to right we have Cavalry, Peltasts, one Elephant, Phalanx, and Cavalry. 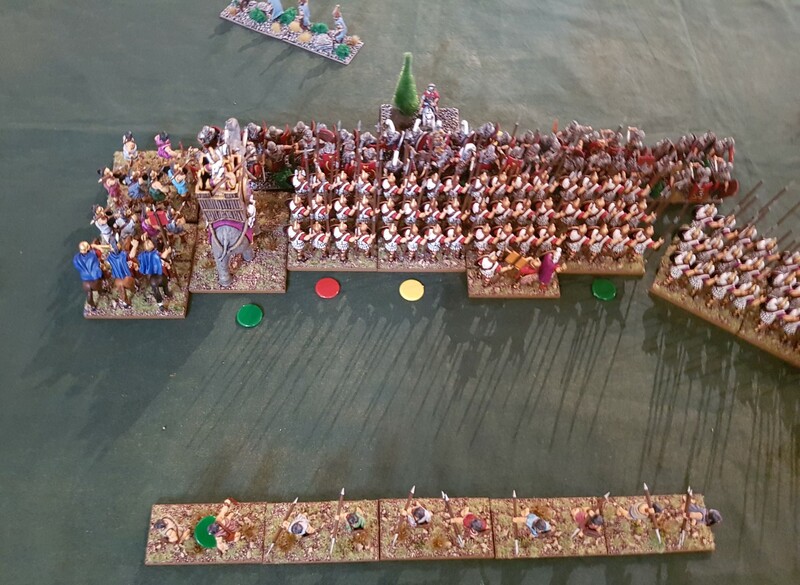 The two right most Pike are the elites with silver shields. 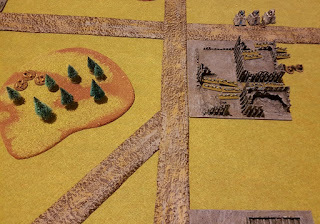 My newish Renedra building kit makes a good defensive position (Built up Area) for my left flank. 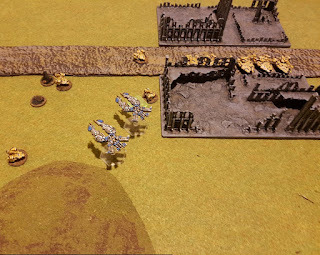 Matt's cavalry on his left flank. 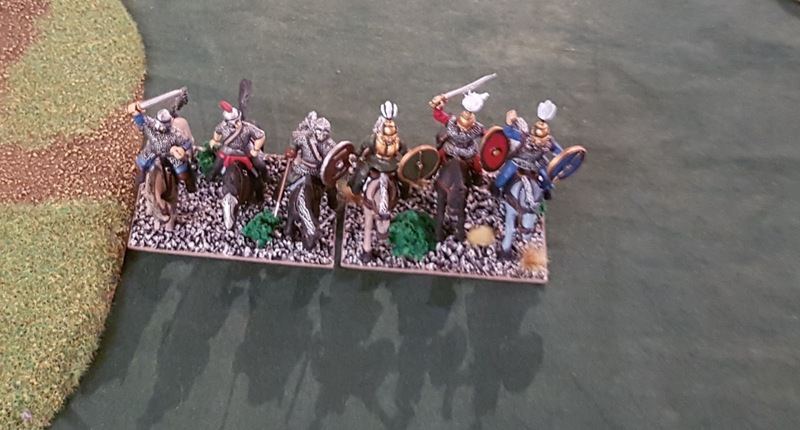 His right flank of a Horse Archer, Cataphracti (Heavy Cavalry Impact) and Auxiliaries. 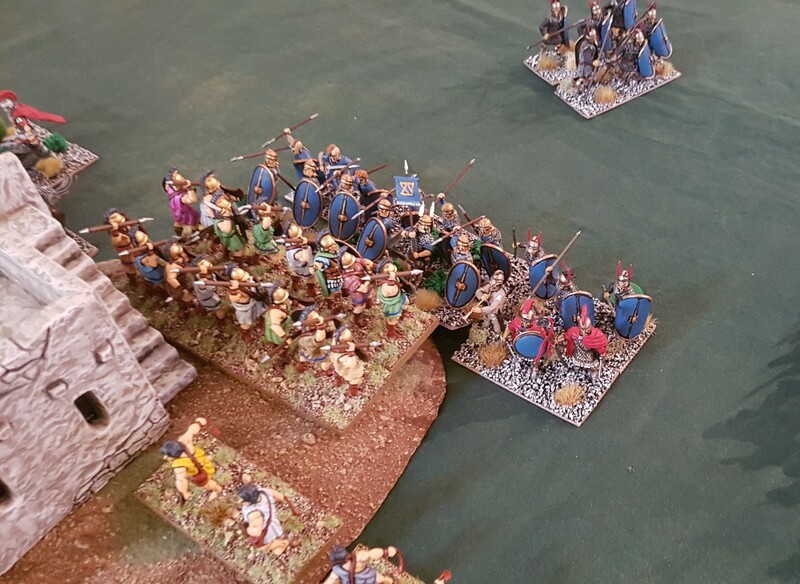 Romans are attackers and advance at the double. 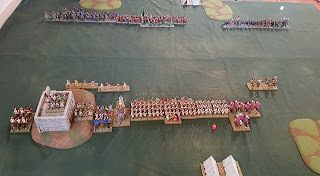 I advance with my centre while Light Cavalry on my right try to outflank, or at least delay the Roman Cavalry somehow. 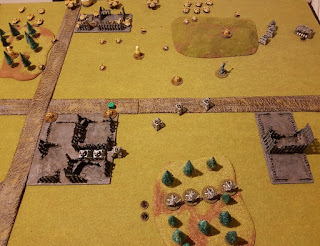 Slingers exchange fire in the centre. 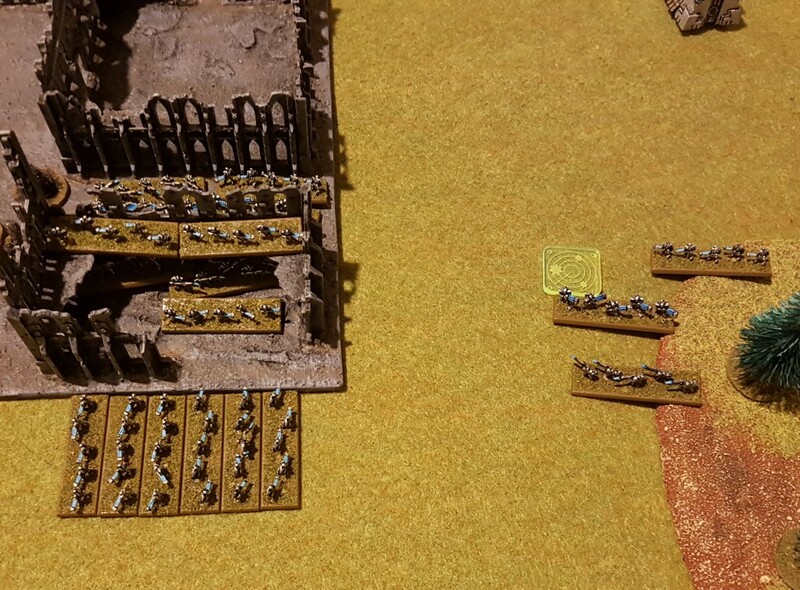 My line charges forward, and the Slingers retreat through their Legionnaires. 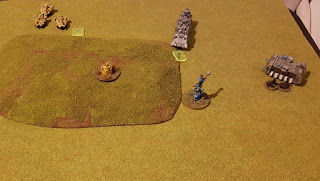 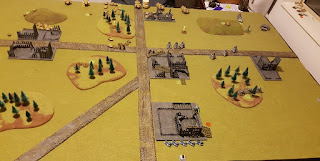 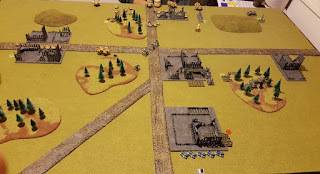 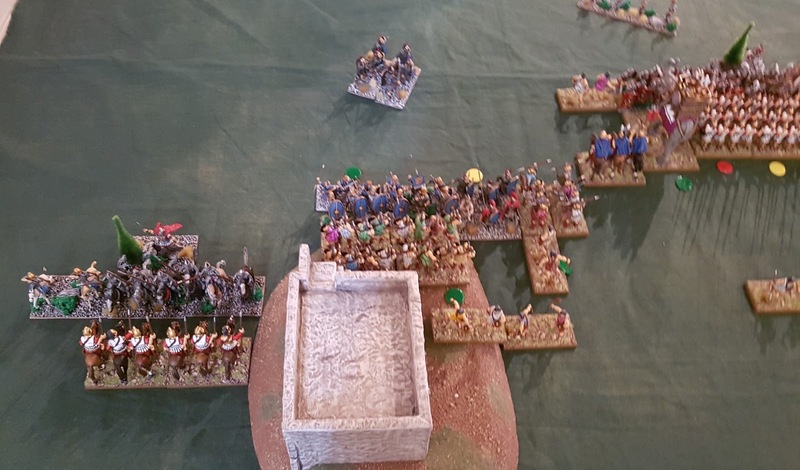 My right flank is angled back trying to avoid being outflanked. 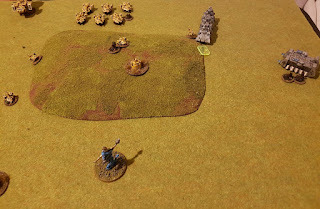 Matt charges down the line. 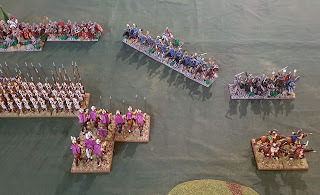 On my right flank I evade with my Light Cavalry, but roll a 5 and so they flee an extra move and off the table, oops. 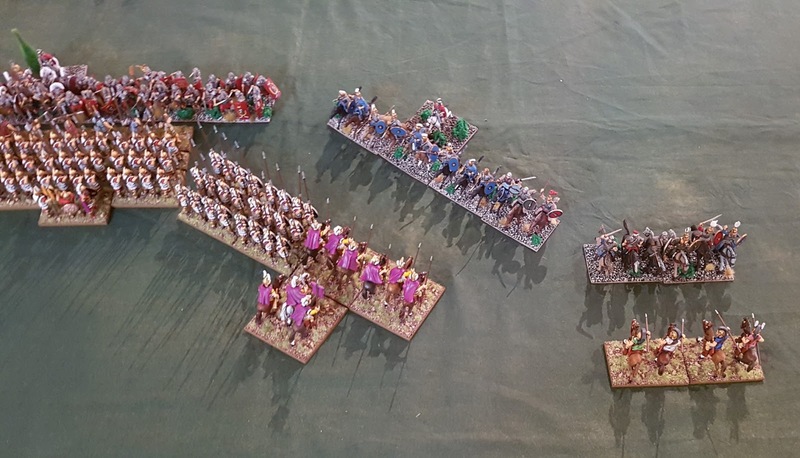 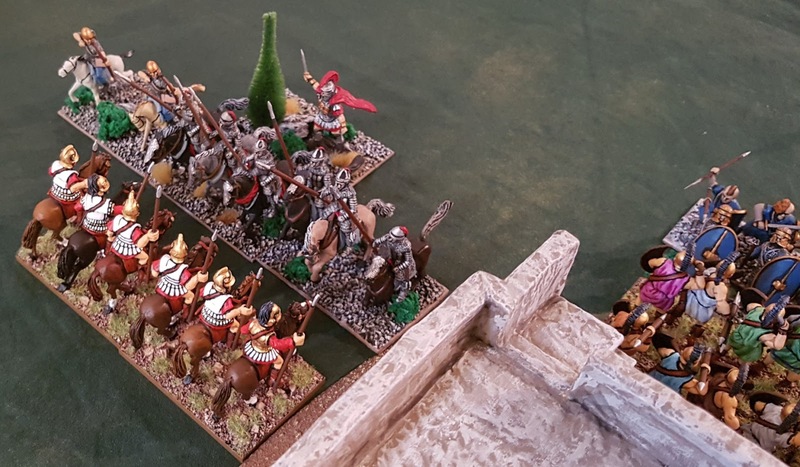 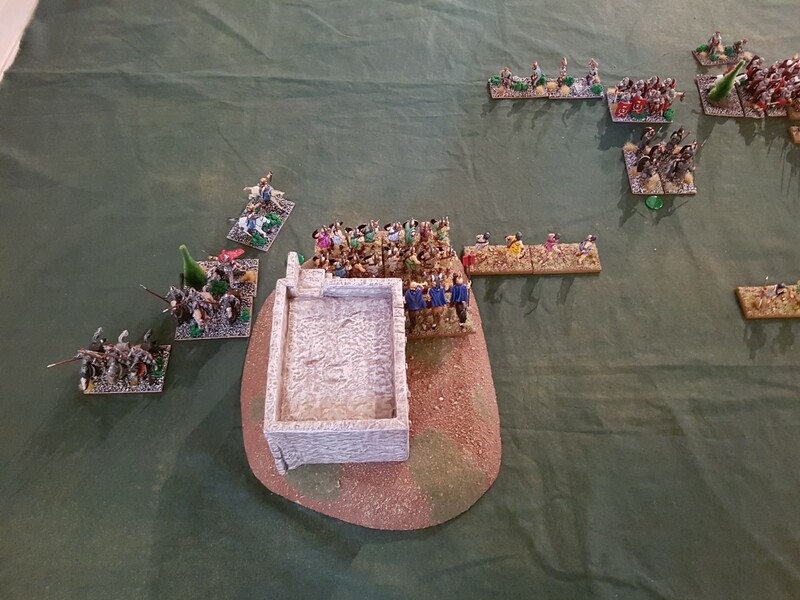 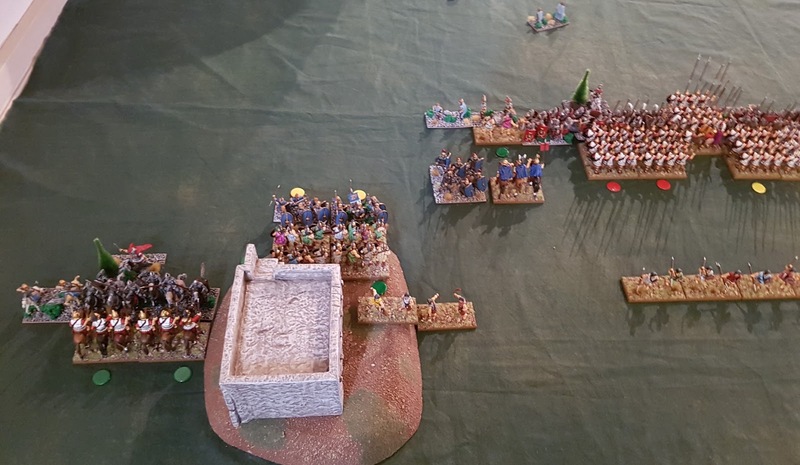 My Greek Cavalry outflanked and facing incoming Roman Heavy Impact Cavalry on my left. 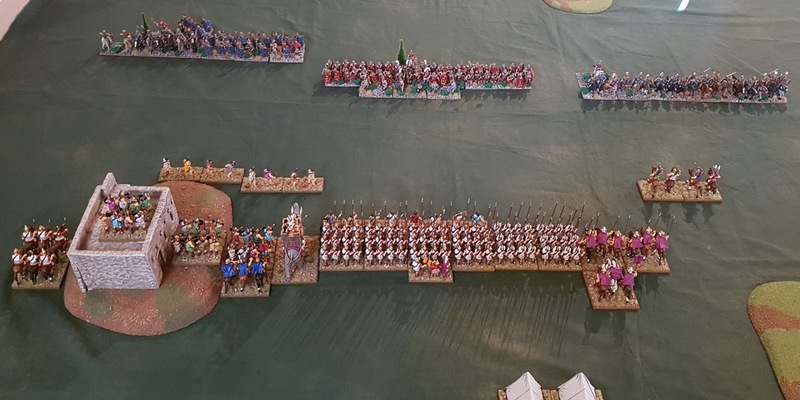 Auxilia charge up the hill against my own medium foot. 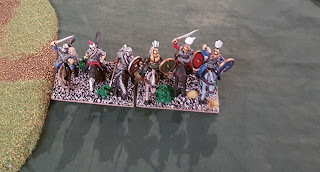 Successful Roman Gallic Cavalry who have just chased my Light Cavalry off the table. 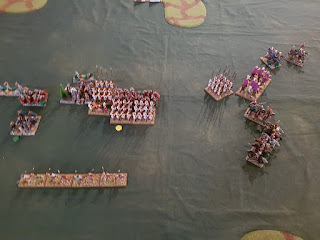 My turn and I manage to hit the flank of the Auxialia attacking my left, and destroy a unit of them. 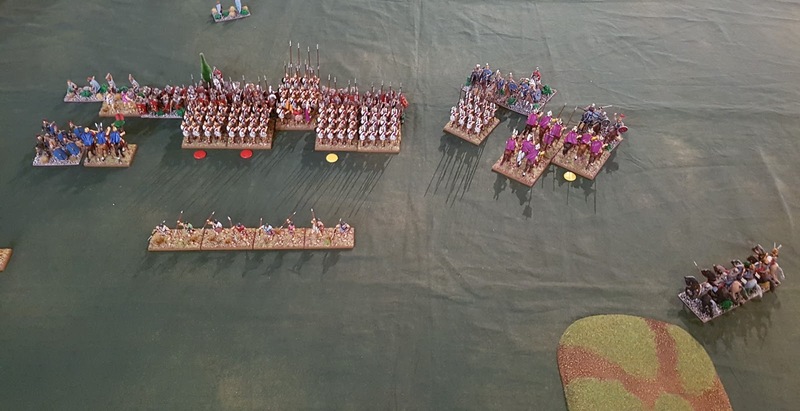 My Pike also bust a hole in the Roman Legionary line, but the rest of my line is looking shaky. 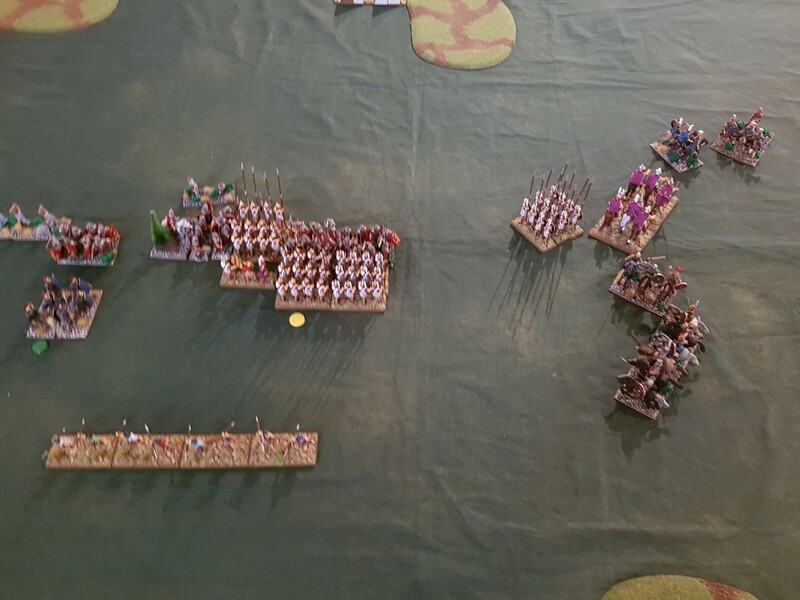 On the right, my Agema try to bust through the enemy cavalry before the Gauls turn around to come back and help. 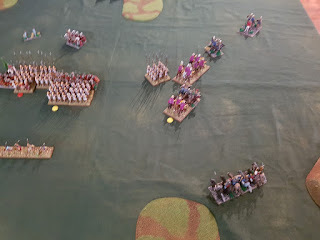 My General leads one unit and causes two hits, but my other unit loses and takes a hit. Here come the returning Gauls, as my General breaks through the enemy cavalry. 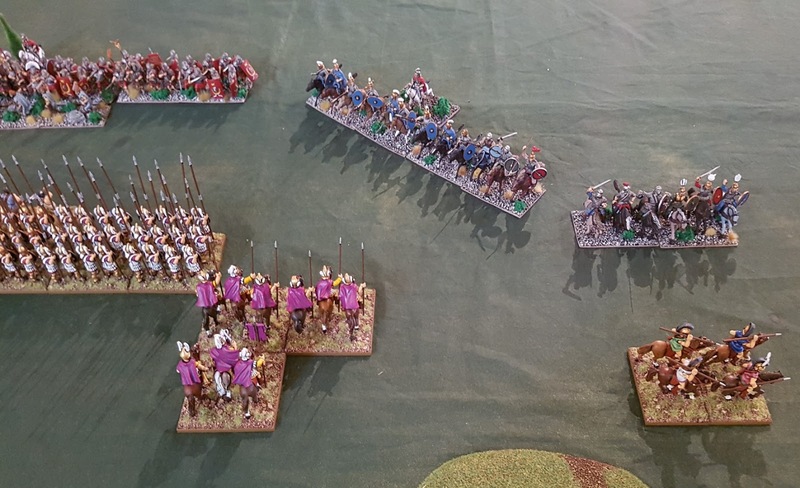 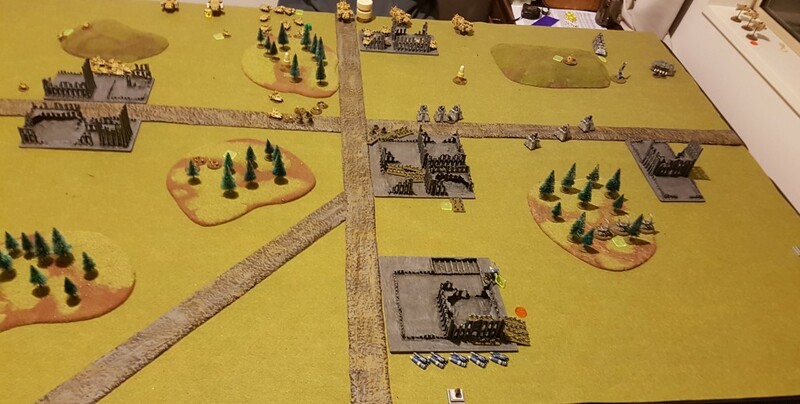 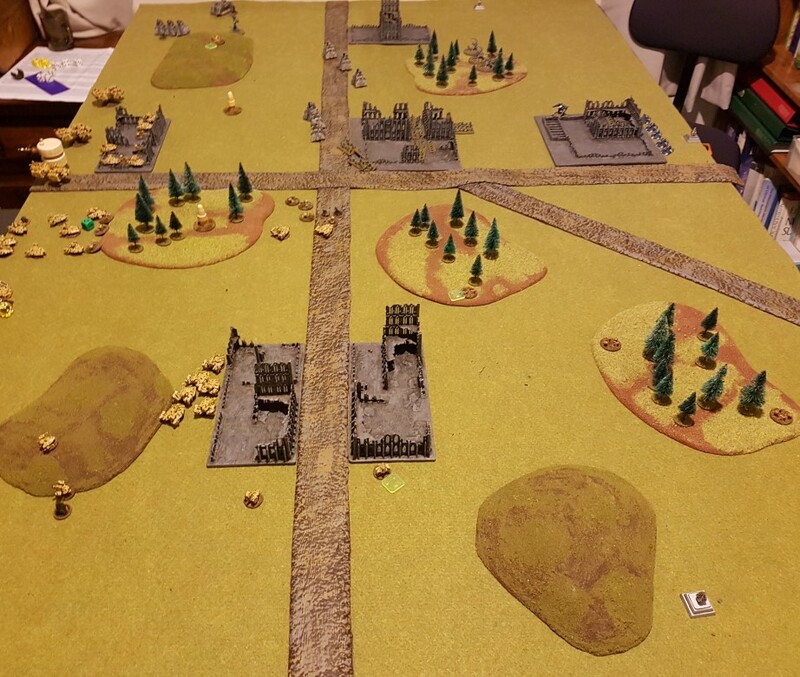 On the left, I lose a unit of Peltasts and the Elephant and my Cavalry is in trouble. My General surges forward after the cavalry on the right which evade. 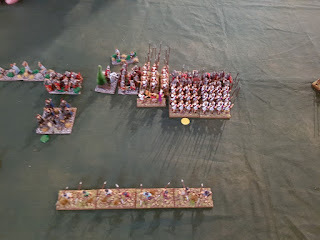 And in the centre I lose a pike block but kill another Legionary unit. 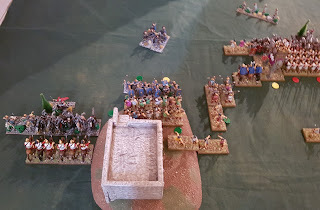 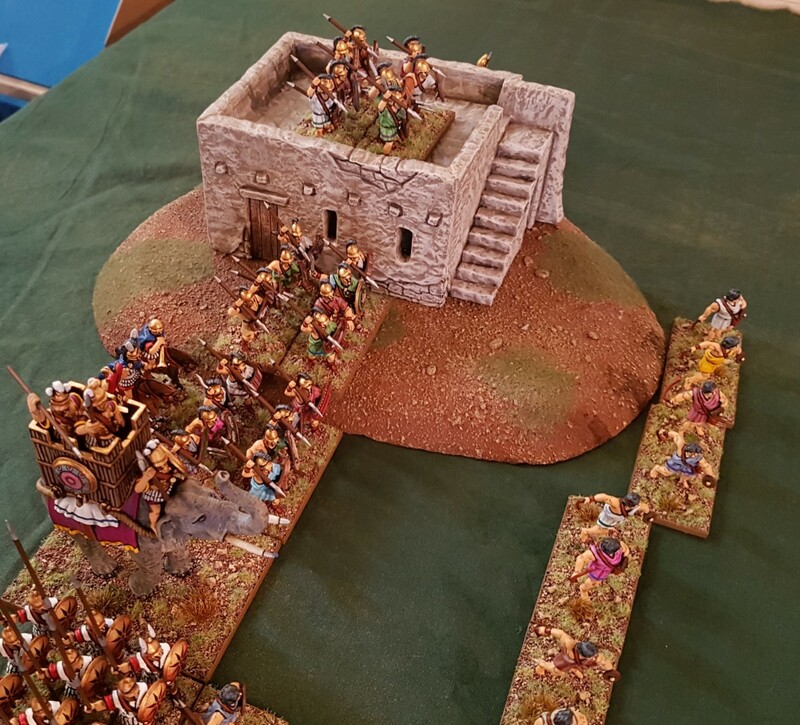 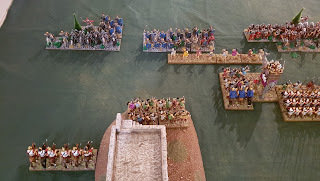 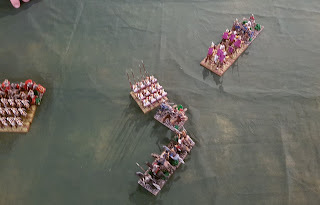 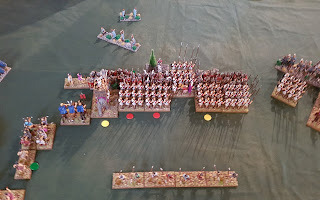 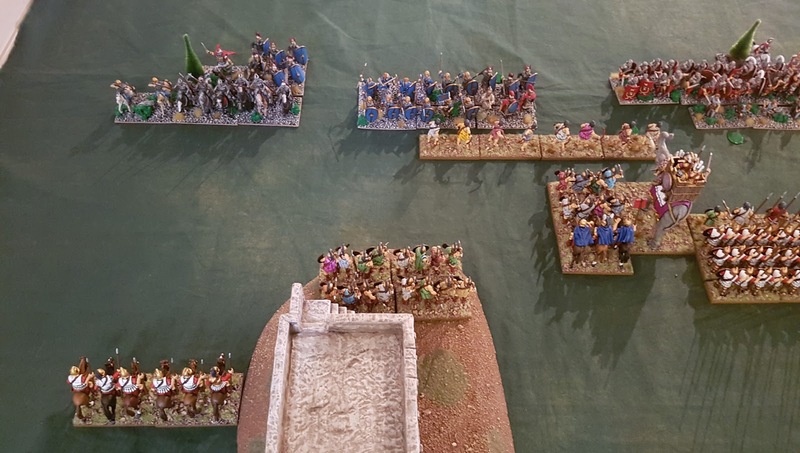 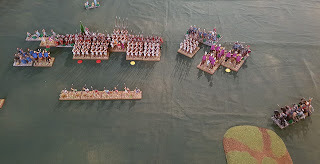 My slingers pelt the Roman Auxilia. 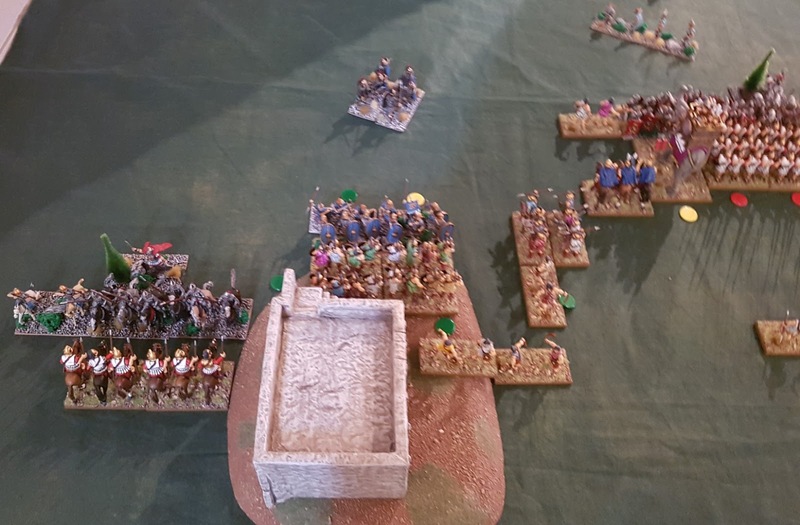 With their hill position helping, Peltasts on my left manage to destroy two Roman Auxilia units. 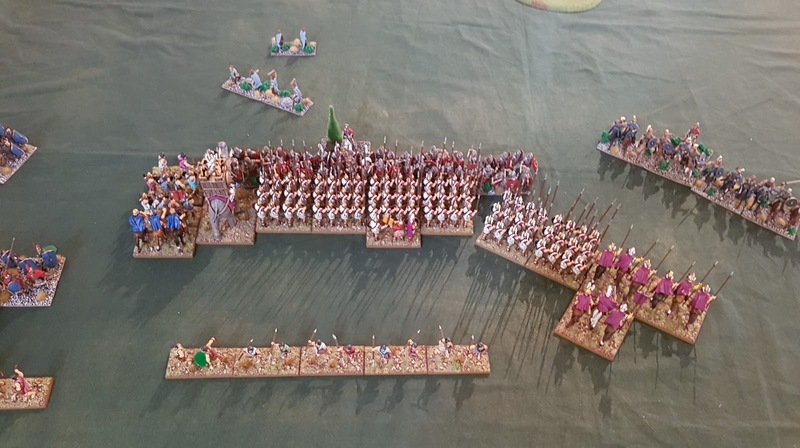 But then my Greek Cavalry are run down on my left. 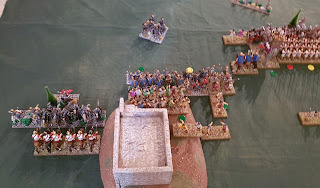 And the Leigionnaries charge into the side of my phalanx. 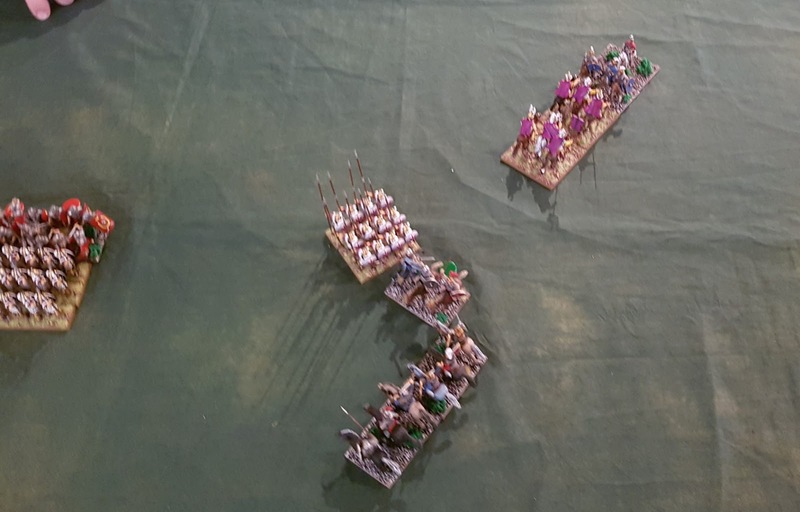 Gauls charge into the flank of a Companion unit and destroy it. Horse Archers shoot my Peltasts doing a point of damage. 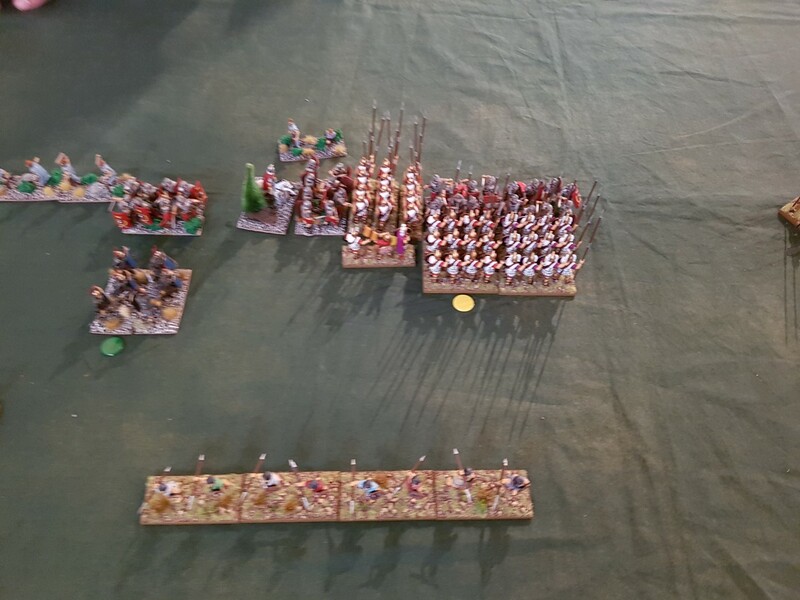 My General charges the Roman Cavalry General who accepts the challenge. 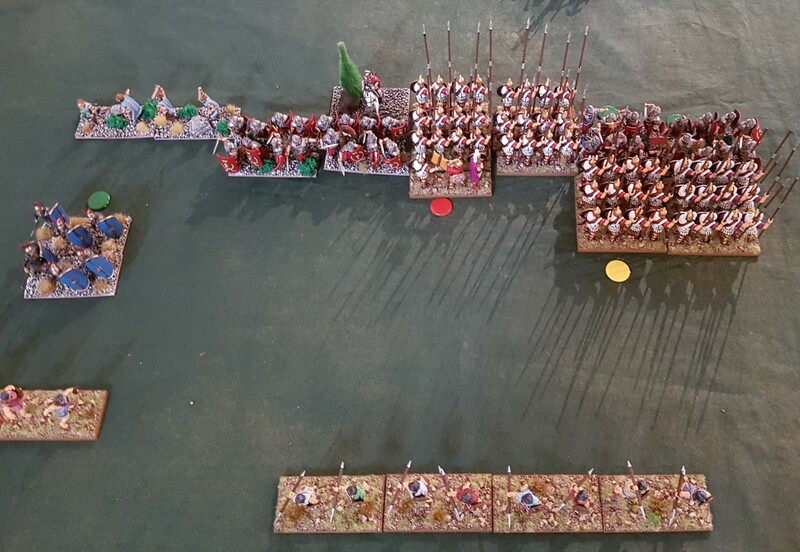 But my centre is falling to pieces fast. 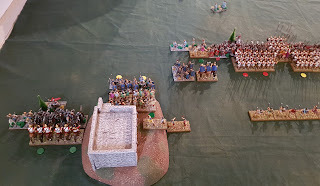 Two more Pike blocks disappear. 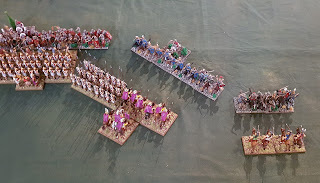 And then I kill the Roman Cavalry General.